Tacos are one of our go-to dinners and a frequent request from the hubs! Since we limit the red meat we eat, we knew we could do better than your typical beefy filled fried taco shell. 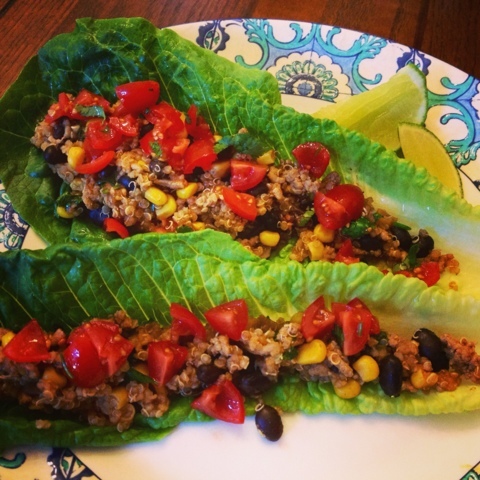 Tonight we're making our ground turkey & quinoa taco lettuce wraps and this taco filling recipe is a winner! If you haven't tried quinoa yet, this is the perfect recipe to introduce it to your family as quinoa blends perfectly with lean ground meat. To cut the meat even more, we packed this stuffing with protein packed black beans and sweet corn. We topped these with a fresh simple salsa made from tomatoes, lime juice and cilantro which was delicious as is but feel free to add on your favorite tacos toppings - just be sure to check the portion & calories before doing so! As each serving here comes in at just 353 calories, you certainly won't break the scale with one tablespoon of part skim Mexican cheese at 20 calories, one tablespoon of taco sauce at 7 calories or even a tablespoon of low fat sour cream at only 20 calories. 2. Add olive oil to deep saute pan and heat to medium high heat. Add ground turkey to pan and saute until browned. 3. 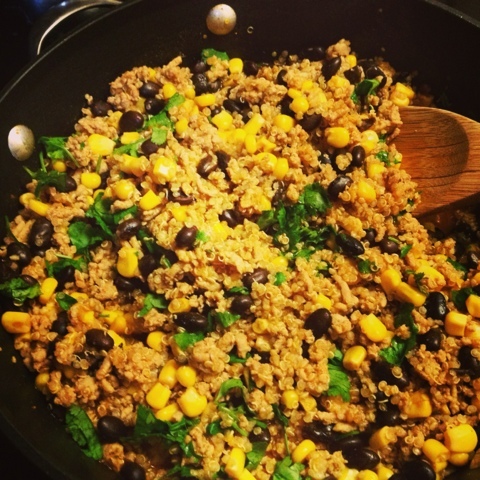 Stir in cooked quinoa, corn and black beans. 4. Add cumin, chili pepper & cayenne and stir to combine. Mix in half your cilantro, season with salt & pepper and add in juice of one lime. 5. Dice tomatoes and mix with remaining cilantro. Stir in juice & zest of remaining lime. 6. Serve up taco filling in romaine lettuce leaf and top with tomato salsa. Make 4 healthy servings, enjoy! Hi girls! Love your blog. I'm your newest follower! Hi this sounds delicious! Thanks for sharing. I found you over at Mom's Monday Mingle link party. I'm your newest twitter and gfc follower and would love a follow back at gloriouslymade.blogspot.com. Thanks Deanna :) Was super yummy!